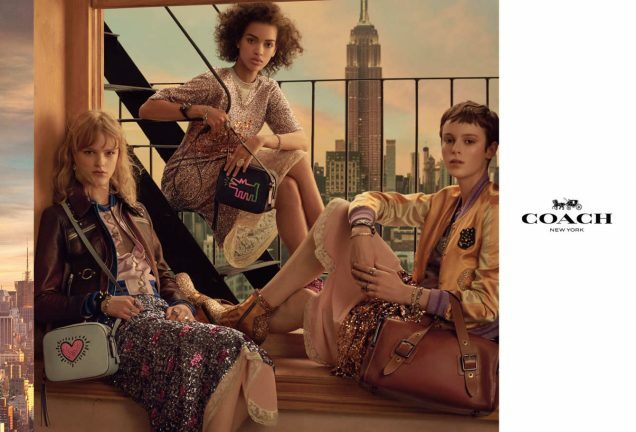 If it seemed as though the Spring 2018 ads — the Coach girls perched on Manhattan fire escapes, Calvin Klein’s Americana-clad barn rats — were more racially diverse than their predecessors, that’s because they were. But the fashion industry still has a mound of work to do, especially when it comes to age, size and transgender representation. See below. After assessing 218 Spring 2018 fashion print ads starring a total of 541 models, we found that this ad season was the most racially diverse yet, featuring 34 percent nonwhite models, a 1.2 point improvement over Fall 2017’s 32.8 percent. Encouragingly, racial diversity in fashion ads has been on an upward trend since Fall 2015 (that’s five consecutive seasons). It seems fashion advertisers are making progress — at least on the racial diversity front. Outside of race, it’s a different story. Of the top nine models who landed the most Spring 2018 ad campaigns, four (44.4 percent) were nonwhite: Gigi and Bella Hadid (who are of Dutch-Palestinian descent), Aube Jolicoeur (originally of Haiti) and Shanelle Nyasiase (of South Sudan). It’s no coincidence that Nyasiase was also the most-booked model of the Fall 2018 runway season, walking in 43 shows. Bella Hadid and Cara Taylor led the group with seven ad campaigns each. Rianne Van Rompaey and Vittoria Ceretti shared second place with six campaigns each. Tied for third were Jolicoeur, Nyasiase, Ansley Gulielmi, Gigi Hadid and Kiki Willems with five ads apiece. 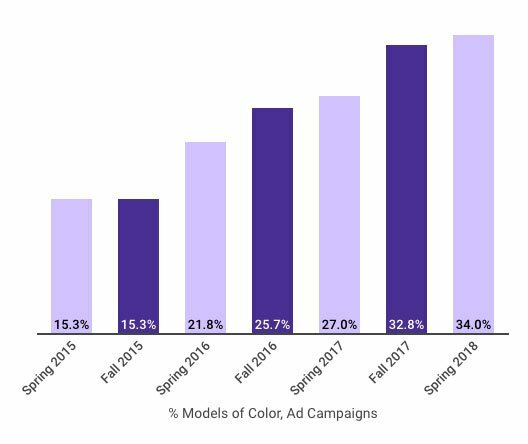 Similarly, though the Spring 2017 and Fall 2017 ad seasons also saw 10 plus-size model castings each, if we look at the data in terms of percentage, plus-size representation in campaigns is actually on the decline (from 2.3 percent in Spring 2017 to 2.2 percent in Fall 2017 to 1.9 percent in Spring 2018). 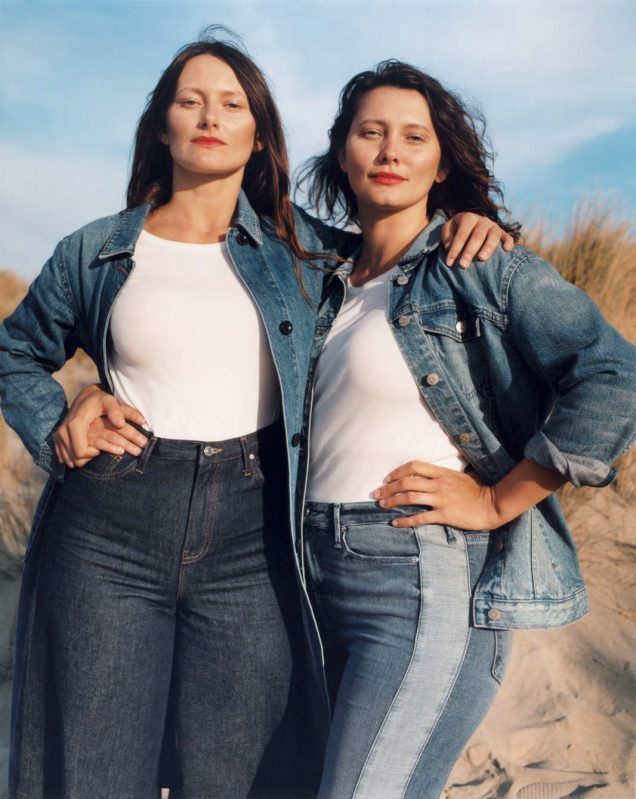 What’s more, while in recent seasons plus-size models have seen increased runway opportunities — both in number and prestige of castings — six of Spring 2018’s seven size-inclusive campaigns belonged to mass-market and plus-centric brands. In the former category: Jennifer and Cassandra Bickman for Nordstrom, Marquita Pring for Gloria Vanderbilt, Sabina Karlsson for River Island and Tara Lynn for Joe Fresh; in the latter: Emme, Bree Kish and Philomena Kwao for Lane Bryant and Ashley Graham for Marina Rinaldi. Rag & Bone was the only luxury label to hire a fuller-figure model (Graham). Disappointing, especially after a relatively inspiring Fall 2017 ad season that saw plus-size women pose for the likes of Dolce & Gabbana and Vivienne Westwood. On the bright side, not all of those plus models hired were young and white (though all openly identify as cis). Three women of color (Karlsson, Pring and Kwao) and one woman over 50 (Emme) landed lucrative advertising campaigns, backward industry values notwithstanding. Although a record 64 transgender and non-binary models walked the Fall 2018 runways and in March 2017, Valentina Sampaio became Vogue Paris’ first out transgender cover star (and in October Condé Nast launched Them, a “mission-driven, multi-platform, LGBTQ-focused” media brand), only four models who openly identify as trans or non-binary landed a Spring 2018 fashion campaign. 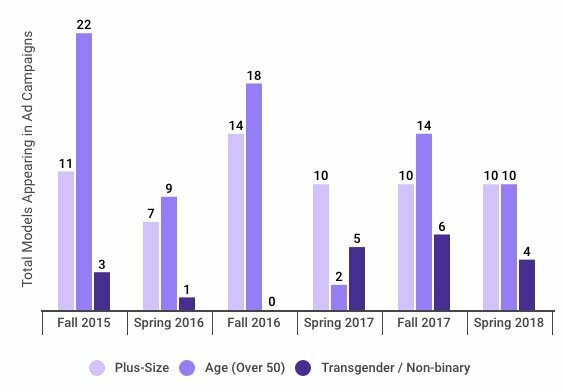 (Down from last season’s six — an all-time “high.”) Thus, as is usually the case, trans and non-binary models were the least represented group this season, accounting for only 0.7 percent of castings (0.6 points less than the Fall 2017 ads). Two of the season’s four castings went to DNA’s Ariel Murtagh, a high school sophomore who, with the support of her mother, transitioned at age 10. A Raf Simons favorite, Murtagh appeared in both Calvin Klein 205W39NYC and Calvin Klein Jeans’ Spring 2018 campaigns (photographed by Willy Vanderperre and Lachlan Bailey, respectively). Though no transgender models of color were cast, River Island did include one androgynous model of color in its label-challenging campaign (Asianna Scott, who also posed for Sisley). Continuing its quest for street cred (see: its recent collaborations with Thaddeus O’Neil, Jeremy Scott, Preen, Phillip Lim and Y/Project), UGG hired androgynous black model Ari Fitz. Thus, the seasonal ads weren’t entirely devoid of nonwhite, gender non-conforming faces. Still, it’s telling that all three trans models to land campaigns were young, white, thin and cis-presenting. It begs the question: Are brands truly challenging social norms or do they just like to think they are? Women over the age of 50 also saw less representation this ad season than last with only 10 castings across 9 campaigns, as compared to last season’s 14 across 8. Though models over 50 weren’t the least represented of all the categories (as is often the case), they did see the steepest decline of any category: in Fall 2017’s ads, 3.1 percent of models were over 50; in Spring 2018, 1.9 percent were older models. Moreover, whereas Fall 2017’s over-50 model castings stood out as much as, or maybe even more than, the clothes — Iman for Valentino, Catherine Deneuve for Louis Vuitton, Isabella Rossellini for Sies Marjan, Cecilia Chancellor, Marie-Sophie Wilson and Benedetta Barzini for Simone Rocha — 2018’s castings lacked the same gravitas with a few exceptions. 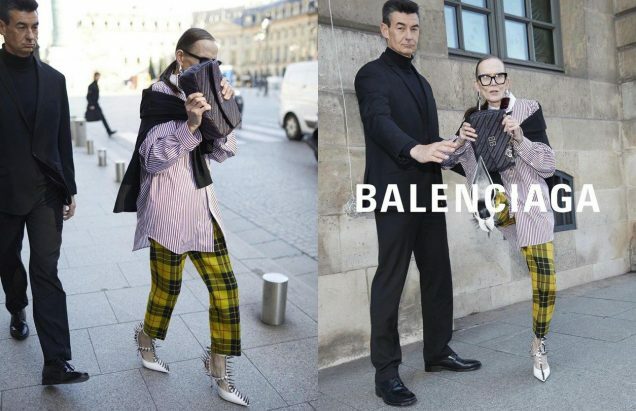 Three luxury brands — Balenciaga, Swarovski and Vivienne Westwood — prioritized age inclusion. Costume designer Marjatta Nissinen starred in the former’s paparazzi-style campaign (captured by actual French paps Sebastien Valiela, Francis Petit, Nikola Kis Derdei and Cyril Moreau and co-starring Stella Tennant, Alek Wek and Eliza Douglas), Maye Musk and Karlie Kloss posed as mother and daughter for Swarovski and Vivienne Westwood represented her eponymous (now Andreas Kronthaler-helmed) label for the second consecutive season. The remaining seven castings came courtesy of mass-market retailers or lesser-known labels: Musk shot with denim brand DL1961, Cindy Crawford with Polish fast-fashion chain Reserved. Iman again posed for Gloria Vanderbilt, this time with fellow industry vet Paulina Porizkova. UGG hired actress, artist, philanthropist and fashion icon Valerie von Sobel; Lane Bryant tapped Chromat favorite Emme. And Sarah Jessica Parker lent her star power to Bloomingdale’s’ “The Heart of New York” campaign (as did Christy Turlington, who will celebrate her 50th in January 2019). Of the season’s limited over-50 casting opportunities, only one went to a woman of color (Iman), one to a plus-size model (Emme). No transgender women over 50 made the cut. Given that the world of fashion advertising seems especially fickle when it comes to women over 50 — Fall 2015’s ads had 22, Spring 2016’s 9, Fall 2016’s 18, Spring 2017’s 2, last year’s 14 — it’s hard to say where it’ll go from here. And now to call out the brands with the most whitewashed ads of the season. Though relatively age-diverse — 90s supers Naomi Campbell, Christy Turlington and Gisele Bündchen starred — Versace’s homage to its late founder featured only 2 models of color out of 12. The Italian fashion house is a repeat offender. Similarly, though denim label DL1961 hired one over-50 model (Maye Musk), all four of its campaign stars were white. Max&Co., Mulberry, Tommy Jeans, Tory Burch and Mango all featured three female models, none of whom were of color. While Tory Burch’s oversight doesn’t come as a shock — recall the label’s remarkably tone-deaf Poppy Delevingne ad — Mango’s is rather surprising, seeing as it’s such a mass-market retailer. Also disappointing: Dolce & Gabbana’s spring ads featured not a single model of color in a lineup of six. As you might recall, this is a stark contrast from Fall 2017, when the label put forth one of the season’s most racially and size-diverse campaigns (featuring 63 percent models of color and one plus-size model, Alessandra Garcia Lorido). Which campaigns ranked highest on the racial diversity scale? Fenty x Puma and Moschino, which exclusively cast models of color (five apiece), led the charge. While Fenty frontwoman Rihanna is a known champion of inclusion, Moschino found itself on our whitewashed list as recently as Fall 2016, so this is a refreshing turn. 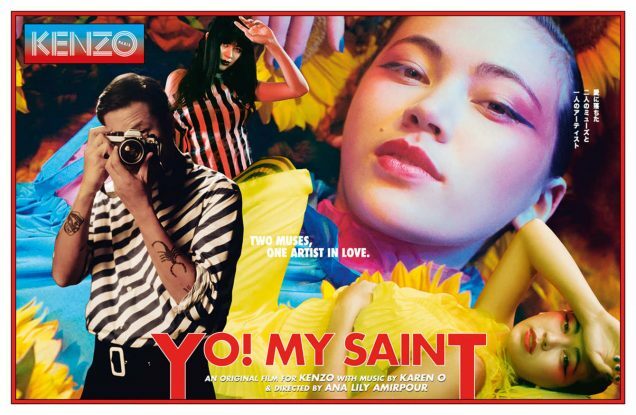 Kenzo, another leader in the fight for race inclusiveness, hired four out of five (80 percent) nonwhite models. Of the models who posed for Net-a-Porter, Just Cavalli, Issey Miyake, Furla, Gap, Bottega Veneta, Burberry, Penshoppe, Tommy Hilfiger, Philipp Plein, Tom Ford and Shiatzy Chen, two in three (66.7 percent) were racial minorities. (And to think Burberry was on our offenders list just one year ago.) Celine, another notoriously exclusive brand, also made a bid at redemption, hiring three out of five (60 percent) models of color. It’s essential that we also acknowledge Swarovski, Nordstrom, Gloria Vanderbilt, UGG and River Island, which were responsible for the most all-around inclusive ads of the season. Swarovski was one of the few luxury labels to cast a woman over age 50 in its campaign, which was also remarkably (41.7 percent) racially diverse. (It starred Jourdan Dunn, Fei Fei Sun and Musk, among others.) 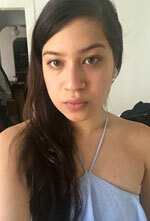 For Nordstrom’s “I AM SPRING” campaign, Vice President of Creative Projects Olivia Kim (again) eschewed traditional casting, hiring a diverse cast of models and creatives of various ethnicities, ages, body types and gender identities (including two plus-size models and one transgender model). True to its mission to create denim for all, Gloria Vanderbilt’s four-model cast included two women over the age of 50 (one of them black) and one whose measurements fall outside the conventional size grid (also a woman of color). UGG’s rebranding efforts not only led it to a buzzy turn on the Y/Project runway, but to a 40 percent racially diverse spring campaign starring both an androgynous model and 77-years-young fashion icon. And while we wholeheartedly agree with River Island’s mantra that #LABELSAREFORCLOTHES, we’d be remiss not to point out that its spring ads accounted for one of the season’s few mass-market plus-size castings and one of its (even rarer) transgender castings. Not to mention four of its eight stars were racial minorities. Per The Business of Fashion, “The consumers who purchase luxury fashion are more diverse than ever. Since 2007, Asia-Pacific’s share of the global luxury goods market has grown by 10 percentage points and today the fastest growing luxury markets in the world are the Middle East and Africa” — and fashion ad campaigns are starting to reflect this. Of the 500-plus female models who appeared in Spring 2018 campaigns, more than one in three were women of color. Sure, that statistic may tell a rosy tale of inclusion, but if you look at diversity outside of race, you’ll be sobered. For all the buzz over their Vogue covers, major cosmetics contracts and big-name runway cameos, transgender, over-50 and plus-size models still aren’t getting cast in ads. (No more so than they were three years ago, at any rate.) So answer us this: When racial diversity is crawling forward at a 1.2 percentage point pace and other forms are stalling or falling off, are the industry’s ideals — aesthetic and otherwise — really changing? Note: In past reports, Bella and Gigi Hadid, who are of Dutch and Palestinian descent, were categorized as white. To more accurately reflect their mixed-race heritage, we’ve updated their categorization to nonwhite and amended our data. Our new racial diversity reading for Fall 2017 is 32.8%, Spring 2017 is 27% and Fall 2016 is 25.7%.